One long-standing — and justifiable — progressive grievance is that whenever ordinary Americans allow their personal plight to enter the public sphere in a way that advances a liberal political goal, they are gratuitously probed and personally smeared by the Right. The most illustrative example is the Frost family, who allowed their 12-year-old son Graeme to deliver a moving radio address explaining the benefits he received from the CHIP program when he was in a serious car accident, only to be promptly stalked and smeared by Michelle Malkin, among others. Today, The Nation — a magazine which generally offers very good journalism — subjects John Tyner to similar treatment, with such a shoddy, fact-free, and reckless hit piece (by Mark Ames and Yasha Levine) that I’m genuinely surprised its editors published it. Beyond the inherent benefit of correcting the record, this particular article is suffused with all sorts of toxic though common premises that make it worth examining in detail. The article is headlined “TSAstroturf: The Washington Lobbyists and Koch-Funded Libertarians Behind the TSA Scandal,” and is devoted to the claim that those objecting to the new TSA procedures — such as Tyner — are not what they claim to be. Rather, they are Koch-controlled plants deliberately provoking and manufacturing a scandal — because, after all, what real American in their right mind would do anything other than meekly submit with gratitude and appreciation to these procedures? Let’s just look at the paragraphs written to “justify” this accusation. So, what’s for dinner tomorrow? Handwritten lyrics scrawled by John Lennon on the back of a demand for an outstanding bill are expected to sell for £350,000 at auction. 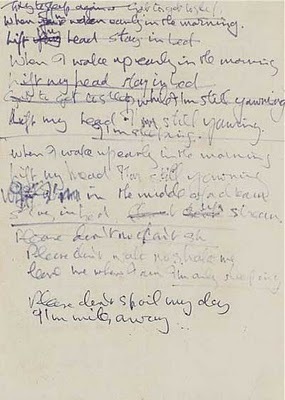 Lennon scribbled the words for I’m Only Sleeping, which appears on the Beatles’ 1966 album Revolver, on the reverse of a letter demanding payment for his “radiophone” – an early car phone. 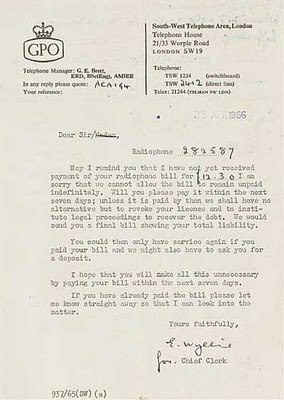 The letter threatens legal action if the bill for £12 and three shillings is not paid within seven days. Lennon wrote the lyrics in April 1966, shortly before the band went into the studio to record Revolver. A private owner is selling the words along with a coffee table from Lennon’s former home, in Kenwood, Surrey. For people who say they are anti-gay, they certainly spend a lot of their time thinking about homosexuality. CHICAGO, Nov. 16 /Christian Newswire/ — Americans For Truth About Homosexuality (AFTAH) today questioned the propriety of “same-gender’ TSA (Transportation Security Administration) “pat-downs” — if the TSA agents doing the ‘patting down” are homosexual, lesbian or bisexual. Homeland Security Sec. Janet Napolitano went out of her way yesterday to stress that the TSA pat-downs are “same-gender” — mostly to reassure women that men will not be groping them at airports in the name of safety. “But what about homosexual TSA agents?” AFTAH President Peter LaBarbera responded. “Isn’t it just as inappropriate for a ‘gay’ male TSA agent to pat down male travelers as it is for a normal, heterosexual male TSA agent to pat down female travelers? A website dedicated to TSA horror stories with the cryptic address of MyTSAHorrorStory.com. Only talk to reporters who agree with her.